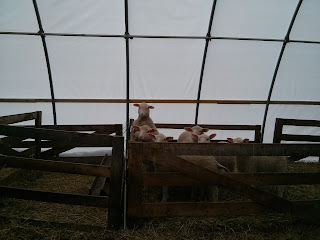 Yesterday I went with my friend Lisa to The Big Farm, in Madison, NH. She had found it online when looking for cheese making classes. 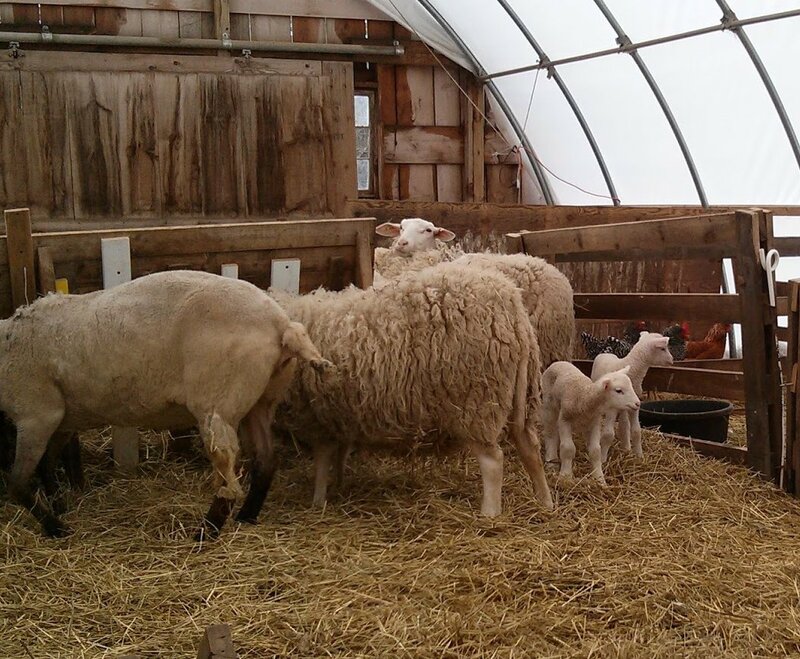 It is a small sheep dairy farm owned by Paul and his family. He makes several aged cheese which he sells at a local farmers market. We were there, with 3 other students, to make cheese. After driving for 2 and a half hours we were greeted by Paul welcomed in to his home, and fed breakfast of warm coffee cake. Mmm. Then, once everyone was there and settled, we got to work! Paul had tables set up with everything we would need: crockpot, filled with 3/4 gallon sheep milk, spoon, whisk, knife, thermometer, and all the various strainers, bowls and molds. 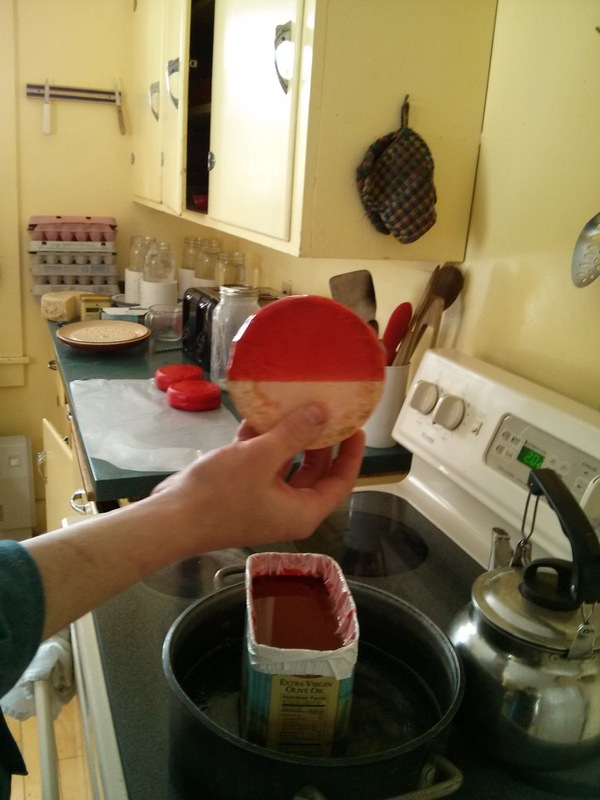 In the morning we made a small sheep milk cheese that will have a reddish rind and be like a reblochon on the inside. First we warmed the milk up to 86-88 degrees. Then we added the different bacteria cultures and waited a bit. Then we added the rennet and waited a bit longer. While we waited we talked about all things cheese, and farming. Once the curds were ready we cut them, waited a little longer, then put them into the cheese molds and put a weight on top for a light press. Then we had lunch. 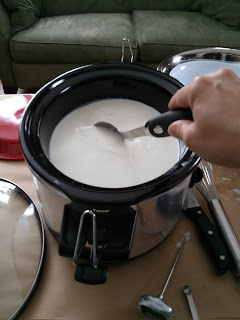 Which consisted of salad, soup, bread and several of Paul's cheeses, including the one we were making. I can only hope that mine comes out that good! He also had a manchego and a havarti-like cheese. Both were great, but I liked the reblochon-like one best. After lunch we flipped our cheese and while that was resting, toured his basement cheese cave. We were taught how to wash the cheeses and then he set a few aside so we could learn how to coat some in cheese wax. We also set up for the next cheese, which is a cow's milk cheddar-type cheese. Paul said it was ok if I brought some of the whey home from the sheep milk to try to make ricotta, so I tucked a gallon jug of the whey into a cooler for later. 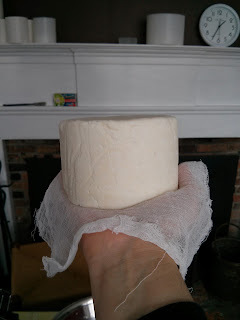 We went through the same process for the cheddar, but since the milk is pasteurized we had to add calcium chloride to make the rennet work better. 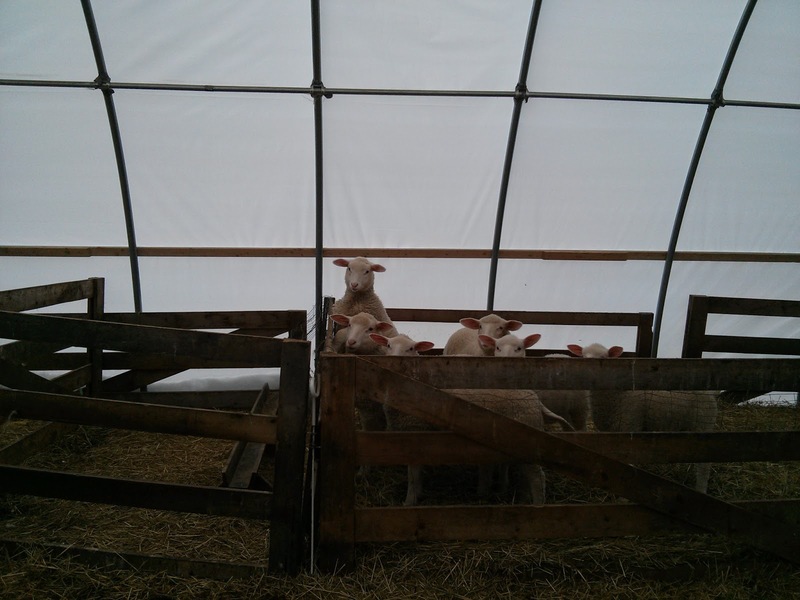 These curds needed to sit longer so we went outside and met the sheep. They made a lot of noise! 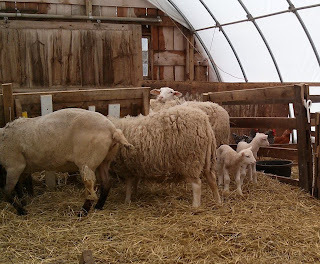 There were a bunch of older lambs in the weaning pen and two littler, twin lambs with their mama. So very cute! Plus some chickens, a turkey, and guinea hens. Paul showed us the set up he has to milk the sheep, which he does by hand twice a day. I think he has about 16 that he milks. After a while we said goodbye to the sheep, and to Piper, the very friendly border collie who played with us. 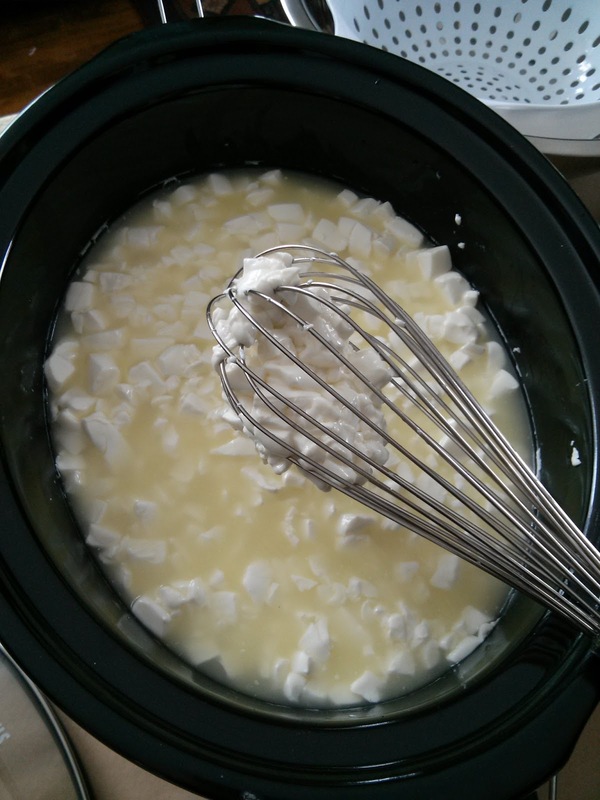 It was time to go back and tend to the cheddar curds. Which were cut, drained, and then pressed into an oval shape on the bottom of the bowl. At that point we "cheddared" them - we stacked one half of the cheese atop the other, and the weight of one pushes the whey out of the other. After a bit they were cut again, salted, and pressed into the mold. These require greater pressure so they went downstairs to Paul's cheese press, an impressive home made device that can press 4 cheeses at once. We started at 15 pounds of pressure and later in the day Paul was going to increase that gradually. Oh, yeah, I didn't go home with any cheese. What? No, they need to age and Paul will age them in his cheese cave and then in 2 months we'll figure out how to get them. I'll let you all know in 2 months how they turned out! After I got home with the whey, I heated it to almost boiling, let it sit for 5 minutes, and then strained it through butter muslin. I got just under 2 cups of ricotta. I don't know if it has the potential to be sweeter; the recipes say the whey can't be more than 3 hours old and there was no way that was happening with the drive I had, and maybe the lactose in it broke down a little. But it is ricotta, and it is edible, and it's the first time I have been able to do that! So, thank you, Paul, for letting us come into your home and make such a mess! I learned a lot, and enjoyed everyone's company, and am so excited to try my cheeses!